Much as I enjoy riding classic dirt bikes I actually spend many more hours on modern machinery, so its only natural that I start pondering on ways to improve a classic with modern technology and thinking. From the outset my ISDT Triumph was not intended to be a faithful replica, rather it was to be strongly reminiscent of the period, yet able to be ridden off road, sometimes in fairly demanding conditions. 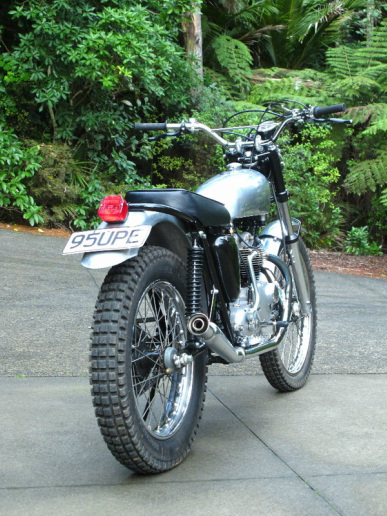 Purists I’m sure would shudder, but then I have yet to see many stock 1960s Triumphs actually used off road and certainly for the adventure rides I’m intending. One of the aspects of the Triumph that I wanted to improve was the riding position. The T100’s typical 1960s feet first, bars-in-your-lap ergonomics make it difficult to stand for any period of time. Covering difficult off road terrain is better done standing on the pegs than sitting in the seat, especially considering that my suspension travel would be limited and that increasing it would radically alter the appearance of the bike. My answer to opening up the riding position would be to more the bars further forward and the footpegs back. Click the link below to read all the detail.